Alcatraz is out of one of the best litters to ever be farrowed here! 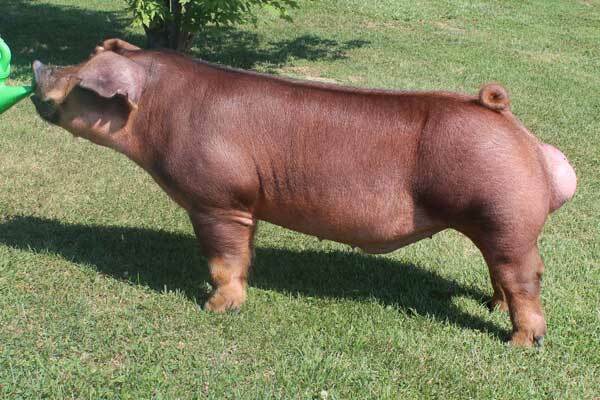 His sire, Prison Style, was the Champion Duroc Boar at the Fall Classic in Duncan in '14. His mother was our pick at STC in '15. She is an Impeccable x Crackin' Down, shown by Justin Wallace. She was raised by Tres Amigos and is a littermate to the mother of First Class @ Premium Blend. Alcatraz has great feet, tight pasterns, heavy bones and clean joints. He is opened up extremely square from the top of his bold, square shoulder blade, through the base of his chest, knee and feet. His top ties perfectly square out of the back side of his shoulder with awesome spread and shape. He has great dimension to his fore rib and center body. His hip is wide and his stifle is big. For as much width and dimension he has, his hock sets square within his skeleton. He has an awesome show pig design on the profile. His head is stout, neck is long and comes out of the topside of his shoulder. His comfort and range of motion off both ends is remarkable. Alcatraz, along with his brother San Quentin, will see a large number of Durocs here! We think these two are BIG LEAGUE! !